JERUSALEM (AP) — Hilda Shlick thought she lost nearly all her family in the Holocaust — until her Internet-savvy grandsons located her brother in Canada. 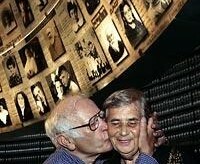 Using the database of Holocaust victims at Yad Vashem, Israel’s Holocaust memorial, two of Shlick’s grandchildren, Benny and David, began unearthing a mystery spanning six decades. While improved technology in recent years has made the task of tracking Holocaust survivors easier, fewer survivors remain as each year passes. Scanning the database, the grandsons, both in their 20s, discovered an entry erroneously stating their grandmother had perished half a century earlier. That entry led them to other surviving relatives, who brought about the siblings’ emotional reunion Friday. When Glasberg, who lives near Ottawa, saw his gray-haired little sister for the first time, he recognized her immediately, he said. “I felt I couldn’t talk. I just cried,” he said. “You don’t understand, 65 years. … ” His voice trailed off. Shlick, 75, said she too was overwhelmed by the discovery. “For 65 years, I lived thinking I had no family besides one sister,” she said. Since Friday’s reunion, the family bond has clearly been re-established, with the two elderly siblings playfully joking and reminiscing in a hearty mixture of Russian and Yiddish. Their large families have quickly become close. The last time the two saw each other was in 1941, when the Glasberg family of Chernowitz, Romania, was separated after the Nazis invaded. Hilda, then 10, escaped to Uzbekistan with her older sister Bertha. The rest of the family — parents Henia and Benzion, and brothers Simon, Mark, Karol and Eddie — stayed in Romania, finding refuge in a basement. The fate of one sister, Pepi, remains unknown. She disappeared and is presumed to have been killed by the Nazis. Glasberg, his brothers and parents emigrated to Canada after the war ended. Shlick and her sister moved to Estonia, where Bertha died in 1970. In 1998, Shlick immigrated to Israel. During a family conversation this summer, her grandsons learned her maiden name was Glasberg, and they began to investigate her past. Karol died that same year, but further searches through the Web site of the Montreal Burial Society and online forums of survivors of Chernowitz, Shlick’s grandsons were able to track down his son, who filled in what happened to the divided family. Shlick’s parents died in the 1980s in Montreal, living well into their 90s, as did her brother Eddie, who died in 2004. Mark Glasberg lives in Ottawa, but was too ill to travel to Israel to meet his sister. His son Irving, however, lives in Israel, just half an hour away from his missing relatives. Shlick said she plans to travel to Canada soon to see her other relatives and visit the graves of the parents she lost as a child. Glasberg, though thrilled to find his sister, said the reunion was bittersweet because of the years the family was divided.